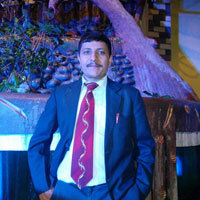 His Post-graduation in English and involvement as Life Member in National Level Project “Nepalese Language Teachers’ and Trainers’ Association, NELTA” offered him tremendous steps onto international Conferences in order to discuss different levels’ and aspects’ issues of English language which led him in zenith of his profession catering innumerable successes in life. The ranges of encounter with international citizens, teaching- learning with them and close attachment with various foreigners aided his diversified profession – TOURISM. This empowered him in order for taking foreign people around the cities, plains, hills and mountains across naturally glowing Nepal. Now, he has diversely centralized his interest on his career along with regular profession in Tourism. He has been engaged in our organization as programme operator since its establishment in order to facilitate our valued tripping guests assisting them to make their visit and stay mesmerizing in Nepal.